The Bermuda Four-Ball Championships concluded at Port Royal Golf Course in rather wet conditions. In the Men’s Championship Division, the team of Jarryd Dillas and Damian Palanyandi extended their overnight lead and won by a comfortable margin of 7 strokes over 2nd place finishers, Eric West and Spencer Wideman. Dillas and Palanyandi shot a 2-under 69 on the day, with West and Wideman also shooting 2-under. Chris Brough and Dan Skoczylas finished third at 1-under par after their two rounds. 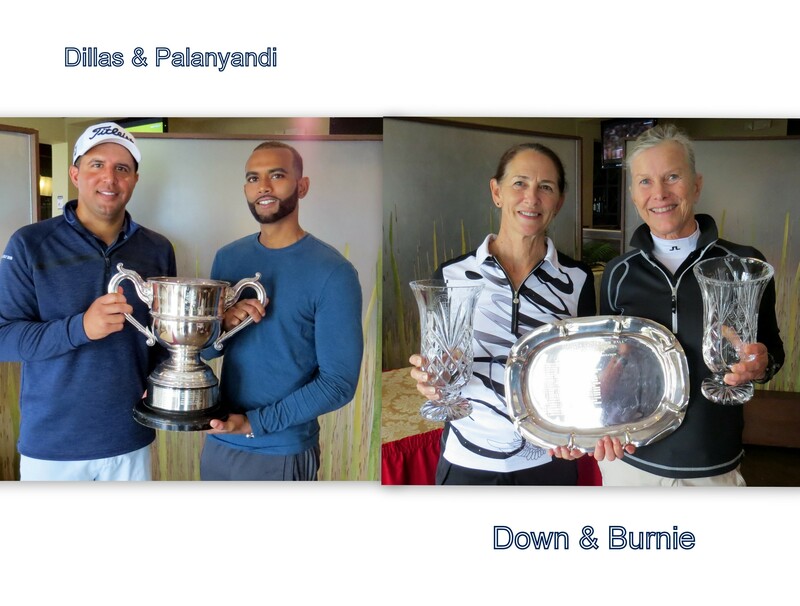 In the Ladies Championship Division, despite a concerted effort on the part of last year’s winners, Katrin Burnie and Linda Down managed to maintain their lead to become the Ladies champions by 4 shots over Tracy Burgess and Ann Symonds. Burnie and Downs shot a second round 9-over par 80, while Burgess and Symonds shot 8-over 79. Gladys Chambaz and Anne O’Neill finished third at 18-over par. In the Senior Men’s Championship Division, Steven Lambert Sr. and Greg Smith were the comfortable winners by 8 shots over Craig Christensen and Ian Page. The champions shot a 2-over par 73, while Christensen and Page shot a second round 6-over par 77. Alexander White and John Noon finished third at 17 over par.